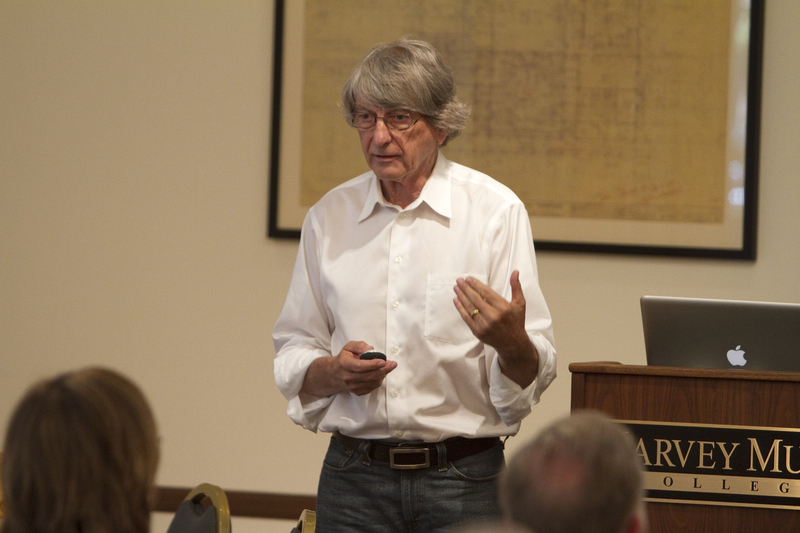 Professor Larry Leifer gives his keynote speech. Recent keynote speakers for the Workshops have included William A. Wulf, then-president of the National Academy of Engineering (2003), James W. Pellegrino, Distinguished Professor of Psychology and Education at the University of Illinois at Chicago (2005), Chris Scolese, Chief Engineer of NASA (2007), Malcolm Lewis, President of Constructive Technologies Group (2009), Alice Agogino, Professor at University of California, Berkeley, Larry Leifer, Professor at Stanford University (2011), David Kelley founder and chairman of the global design firm IDEO and the founder of Stanford University’s Hasso Plattner Institute of Design (2015), and Janet McDonnell, Head of Research at Central Saint Martins, University of the Arts, London (2015). The Workshops’ Organizing Committees have drawn a variety of leading engineering educators, including (for 2007, 2009, 2011): Clive L. Dym, Harvey Mudd College (Chair); Alice M. Agogino, University of California, Berkeley; Philip E. Doepker, University of Dayton; Cindy J. Atman, University of Washington; J. Edward Colgate, Northwestern University; Daniel D. Frey, Massachusetts Institute of Technology and Singapore University of Technology and Design; Ahmad Ibrahim, Yorkville University; John S. Lamancusa, Pennsylvania State University; Larry J. Leifer, Stanford University, Chris L. Magee, Massachusetts Institute of Technology and Singapore University of Technology and Design; Gregory B. Olson, Northwestern University; John W. Prados, University of Tennessee, Knoxville; Sheri D. Sheppard, Stanford University; Janis P. Terpenny, Virginia Polytechnic Institute and State University; and John W. Wesner, Carnegie Mellon University. Registrants represent a wide range of U.S. engineering schools, including Arizona, ASU, BYU, CMU, Clemson, Cornell, George Mason, Georgia Tech, Idaho, Minnesota, Missouri, Northwestern, Olin, Penn State, Pittsburgh, RPI, Smith, Stanford, Tennessee, Texas A & M, Texas Tech, Tulane, USC, Utah State, Virginia Tech, Washington, and Yale. Overseas participants have also been plentiful, representing Aalborg (Denmark), Budapest University for Technology and Economics, Hong Kong U of Science and Technology, Institutt for Informatikk (Oslo), Maastricht, Technion–Israel Institute of Technology, Technical University of Berlin, Technical University at Delft, Technical University of Denmark, Tel Aviv, and Universidad Politécnica de Valencia. The MDWs have become self-supporting, another indication that the MDW series is regarded as an excellent investment in the vast free market of conferences and meetings. Ironically, a 2001 proposal to the NSF was rejected in part because the series of workshops was regarded as “too successful” to warrant further support. Post-workshop assessments for MDW III–VIII were done by a subcommittee of the Organizing and Advisory Committees, with participant respondents finding almost universally that the workshops provided important intellectual content on design pedagogy and “creating a vibrant community” of design educators and design practitioners. Finally, proceedings of the Workshops have appeared as special issues in Artificial Intelligence for Engineering Design, Analysis and Manufacturing (MDW I) and in the International Journal of Engineering Education (MDW II–VIII). Here is the official Assessment Report of our past workshops.